Chi first picked up a camera while a student at Rutgers. After honing his skills at the International Center of Photography, he landed a job at The Source, which was the definitive magazine of hip hop culture. It was here that Chi developed relationships with the biggest icons of the hip hop movement, including Tupac Shakur, Notorious B.I.G., Mary J. Blige, and L-L Cool J, most of whom were not yet famous. In addition to shooting over 30 cover photos for The Source as their Director of Photography, Chi was able to capture the musicians in candid, unexpected moments, due to his disarming manner and unique perspective. His photos include some of the most groundbreaking, memorable images of that era, including Tupac Smoking and Biggie WTC (standing in from of the World Trade Towers). He not only chronicled and defined the most important phase of the hip hop movement, now a global force, he also was able to define the artists and show them as real people, rather than one-dimensional celebrities. Chi’s unusual background is probably responsible for the unique way he sees and captures the world around him. Born in Nigeria and raised in New Jersey, Chi had to decide at a young age whether to return with his parents to Nigeria or stay behind at boarding school. He chose boarding school, and found himself at Lawrenceville, the prestigious prep school attended by the likes of Michael Eisner and Malcolm Forbes. With his parents on the other side of the world, Chi developed a strong independent streak, which later would manifest itself in his work. Chi’s most recent project began in August 2013, when massive images of his started appearing on the exterior walls of select NYC buildings, as part of an ongoing installation called Uncategorized. The first four images that went up in August included two in SoHo – a 12’ x 9’ rarely seen photo of hip hop legend Tupac Shakur, and a riveting 25’ x 16’ photo of young school boys in the back of a church in Modu’s native Nigeria, and two in Brooklyn – a 16’ x 22’ photo of 21 year old Snoop Dogg shot in 1993 and never released, and a 22’ x 16’ shot of Method Man with smoke curling out of his mouth. In November, an iconic 22’ x 16’ photo of Notorious B.I.G. standing in front of the World Trade Towers went up in the Lower East Side of Manhattan. Within 5 years of this photo being taken, both Biggie and the Towers would be gone. 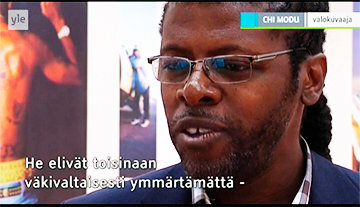 The exhibit will coincide with Pori Jazz , an international music festival whose past performers have included Miles Davis, Kanye, Sting, Alicia Keyes, Mary J. Blige, Stevie Wonder, Elton John, and Herbie Hancock. Chi’s training as a photographer together with his unique perspective on life make him an uncanny observer of human nature, and a natural at mining provocative insights. As the founder of the strategic think tank Diverse Insights, Chi and his team bring insights to life using brilliant photography, a technique he calls Visual IQ™. Chi counts major ad agencies like Saatchi & Saatchi and advertisers like General Mills, Reebok, and Miller Beer among the companies that have benefitted from his fresh perspective. In addition to his impressive collection of hip hop photos, Chi has amassed a wealth of travel, sports, entertainment, and lifestyle images. Despite the differences in his subject matter, Chi’s work has a singular focus – it all reflects his refreshing take on the world. Whether it’s kids at a church in Nigeria, a group of fishermen cleaning their catch in Morocco, a musician playing for money near Prague Castle, or Tupac himself caught in an unexpected moment, the perspective is always as unique and disarming as the photographer himself. Chi’s timeless, unique photographs are often requested for commercials, films and music documentaries along with being held in private collections. His images have also been licensed by Sony, Paramount, Viacom, The New York Times and The LondonTimes. Even Rolling Stone realized its epic book, “The ‘90s: The Inside Stories from the Decade That Rocked,” would not have been complete without Chi’s iconic photo of Tupac. In addition to The Source, his photos have graced the covers of Rolling Stone Magazine and Jazz Times, and album covers for Snoop, Method Man, Mobb Deep, Mad Lion, and Christian McBride. His work has also appeared in numerous exhibitions, including the Hutchins Gallery, Lawrenceville School, Lawrenceville NJ, the Brooklyn Museum of Art, Brooklyn NY, and the Rock and Roll Hall of Fame in Cleveland OH. Chi is also the founder another photo-based venture—ephotos.com.